A personal journal belonging to U.S. Ambassador to Libya Christopher Stevens was obtained by CNN, and The Wall Street Journal is reporting that it "broadcast reports based on its contents against the wishes of the Stevens family, according to relatives and State Department officials who were asked to intervene by the family." The cable news network didn't publicly acknowledge having the journal until Friday night. According to an un-bylined story posted Saturday on CNN's website "four days after he was killed, CNN found a journal belonging to late U.S. 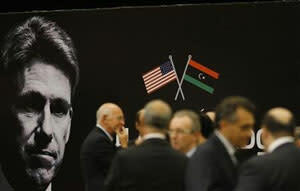 Ambassador to Libya Chris Stevens. The journal was found on the floor of the largely unsecured consulate compound where he was fatally wounded." Stevens and three other Americans were killed in an attack by militants in the American consulate in Benghazi on Sept. 11. CNN claims on its website that it "notified Stevens' family about the journal within hours after it was discovered and at the family's request provided it to them via a third party." The Journal reports that the slain ambassador's family contacted the State Department, which put together a conference call between the Stevens family and CNN. During the call, the family "personally appealed to the news organization to return the journal and to not publish or broadcast any of its contents, according to a Stevens family member and State Department officials." The family also told CNN that they wanted to look at the seven-page handwritten journal before the news organization used it, "saying the ambassador's personal writings belonged to them." The Journal reports that CNN agreed to not use the contents of the diary until the family had had a chance to look at it themselves. The Journal reports that State Department officials arranged to have CNN give the journal to an Italian diplomat in Benghazi, using a third party because U.S. diplomats had evacuated the city after the Sept. 11 attack. On Wednesday, CNN talk show host Anderson Cooper told Sen. John McCain on "Anderson Cooper 360," that "a source familiar with Ambassador Stevens's thinking told us that in the months before his death he talked about being worried about the never-ending security threats that he was facing in Benghazi and specifically about the rise in Islamic extremism and growing al Qaeda presence." The source, Cooper said, "also mentioned (Stevens) being on an al Qaeda hit list." The Journal reports that "a spokesperson for CNN said the network didn't report directly from the journal, but corroborated the information through other sources." Cooper acknowledged on his show Friday night that CNN had obtained Stevens's journal and it had played a role in the network's reporting. "Some of that information was found in a personal journal of Ambassador Stevens in his handwriting," Cooper said Friday. "We came upon the journal through our reporting and notified the family. At their request, we returned that journal to them. We reported what we found newsworthy in the ambassador's writings." CNN was contacted Friday afternoon by the Huffington Post, but the network chose not to comment. CNN referred HuffPo to Cooper's comments after they aired. The Journal says the State Department disputes CNN's account. It goes on to report that "Philippe Reines, a senior adviser to Secretary of State Hillary Clinton, said it took repeated prodding to get CNN to agree to return the journal."